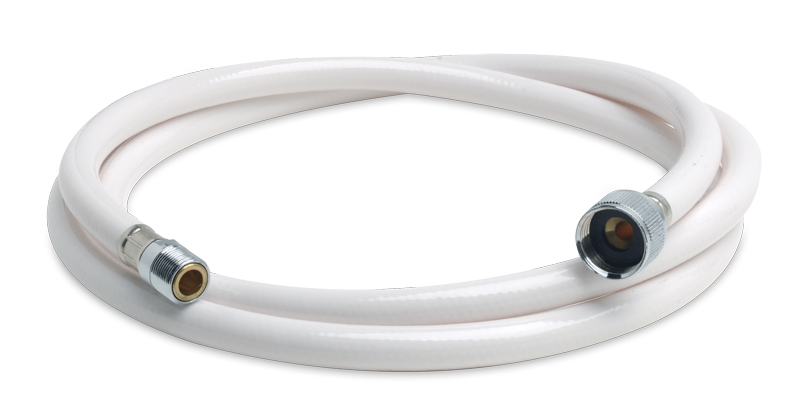 Our heavy duty White and Black Rubber Hoses feature UV protected nylon to reduce cracking and prevent discoloring. Available in a variety of lengths and connection styles. Our heavy duty Stainless Steel Hoses feature a soft inner nylon hose wrapped in a continuous stainless steel ribbon. They are very flexible and have little-to-no “memory”, making them ideal for gathering in tight spaces. Available in a variety of lengths and connection styles. Coming Soon • Polished stainless steel • 10' (extra long) heavy duty stainless steel hose • Soft inner nylon hose wrapped in a continuous stainless steel ribbon makes hose very flexible with little-to-no "memory", making it ideal for gathering in tight space • Bras..
Coming Soon • Black • 10' (extra long) heavy duty nylon hose • UV protection • Brass fittings • Fittings: 1/2" NPS-F and 1/2" NPS-F (adapter) • For use with: most Ambassador Marine or SHURflo branded Deck Sprayers – May be used to 'upgrade' existing units w..
Coming Soon • Black • 10' (extra long) heavy duty nylon hose • UV protection • Brass fittings • Fittings: 15/1 Metric-M and 1/2" NPS-F • For use with: Ambassador Marine or SHURflo branded Trinidad Head / Shower Combo Faucets and Aidack Pull-Out Deck Taps – ..
• White • 10' (extra long) heavy duty nylon hose • UV protection • Brass fittings • Fittings: 1/2" NPS-F and 1/2" NPS-F • For use with: Ambassador Marine or SHURflo branded Recessed / Transom / Slide Bar / Hand-held / External Showers and some Deck Spr..
Coming Soon • Black • 10' (extra long) heavy duty nylon hose • UV protection • Brass fittings • Fittings: 1/2" NPS-F and 1/2" NPS-F • For use with: Ambassador Marine or SHURflo branded Recessed / Transom / Slide Bar / Hand-held / External Showers and some D..
• Polished stainless steel • 4' heavy duty stainless steel hose • Soft inner nylon hose wrapped in a continuous stainless steel ribbon makes hose very flexible with little-to-no "memory", making it ideal for gathering in tight space • Brass fittings • Fittings: Spout..
• Black • 6' heavy duty nylon hose • UV protection • Brass fittings • Fittings: 1/2" NPS-F and 1/2" NPS-F (adapter) • For use with: most Ambassador Marine or SHURflo branded Deck Sprayers In Ambassador Marine bulk packaging Replac..
• White • 6' heavy duty nylon hose • UV protection • Brass fittings • Fittings: 1/2" NPS-F and 1/2" NPS-F (adapter) • For use with: most Ambassador Marine or SHURflo branded Deck Sprayers In Ambassador Marine bulk packaging Replac..
• Polished stainless steel • 6' heavy duty stainless steel hose • Soft inner nylon hose wrapped in a continuous stainless steel ribbon makes hose very flexible with little-to-no "memory", making it ideal for gathering in tight space • Brass fittings • Fittings: 1/2" ..
• White • 6' heavy duty nylon hose • UV protection • Brass fittings • Fittings: 15/1 Metric-M and 1/2" NPS-F • For use with: Ambassador Marine or SHURflo branded Trinidad Head / Shower Combo Faucets and Aidack Pull-Out Deck Taps In Ambassador Marine retail ..
• White • 6' heavy duty nylon hose • UV protection • Brass fittings • Fittings: 15/1 Metric-M and 1/2" NPS-F • For use with: Ambassador Marine or SHURflo branded Trinidad Head / Shower Combo Faucets and Aidack Pull-Out Deck Taps In Ambassador Marine bulk pa..
• Black • 6' heavy duty nylon hose • UV protection • Brass fittings • Fittings: 15/1 Metric-M and 1/2" NPS-F • For use with: Ambassador Marine or SHURflo branded Trinidad Head / Shower Combo Faucets and Aidack Pull-Out Deck Taps In Ambassador Marine bulk pa..
• Polished stainless steel • 6' heavy duty stainless steel hose • Soft inner nylon hose wrapped in a continuous stainless steel ribbon makes hose very flexible with little-to-no "memory", making it ideal for gathering in tight space • Brass fittings • Fittings: 15/1 ..
• Polished stainless steel • 6' heavy duty stainless steel hose • Soft inner nylon hose wrapped in a continuous stainless steel ribbon makes hose very flexible with little-to-no "memory", making it ideal for gathering in tight space • Brass fittings • Fittings: Spout..
• White • 6' heavy duty nylon hose • UV protection • Brass fittings • Fittings: 1/2" NPS-F and 1/2" NPS-F • For use with: Ambassador Marine or SHURflo branded Recessed / Transom / Slide Bar / Hand-held / External Showers and some Deck Sprayers ..
• Black • 6' heavy duty nylon hose • UV protection • Brass fittings • Fittings: 1/2" NPS-F and 1/2" NPS-F • For use with: Ambassador Marine or SHURflo branded Recessed / Transom / Slide Bar / Hand-held / External Showers and some Deck Sprayers ..
• Chrome & black • 6' heavy duty nylon hose • UV protection • Brass fittings • Fittings: 1/2" NPS-F and 1/2" NPS-F • For use with: Ambassador Marine or SHURflo branded Recessed / Transom / Slide Bar / Hand-held / External Showers and some Deck..